Let's start off this review by explaining what the B360 chipset is. Up until today, Intel had only one 300-series chipset available for anyone contemplating an 8th Gen Core CPU. That chipset is the fully-featured Z370. Now, however, Intel wants to introduce more flexibility and value into the desktop market by making an additional eight CPUs available - split between regular and low-power - and a further four chipsets to support them. Enter the Q370, H370, H310 and, of course, B360. This at-a-glance table shows what each brings to the table. 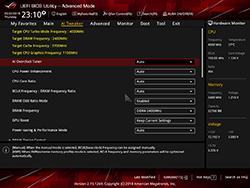 Z370 still remains the best, imbued with the most connectivity and ability to overclock K-series chipset. The B360 reduces the chipset's high-speed I/O lanes from 30 to 24, meaning less opportunity for expansion. 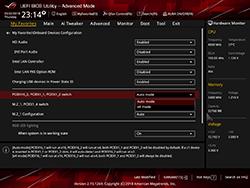 Whereas Z370 touts 24 PCIe Gen 3.0 lanes for said expansion, B360 limits this to 12. This reduction is important because it has a direct impact on how competing technologies - M.2, PCIe of varying speeds - play with each other. We already know there can be lane contention on Z370 if you populate the board fully; this situation becomes more difficult for B360, so whilst the CPU still provides 16 PCIe lanes routed out to graphics (albeit not splittable into 2x8, like Z370), adding in x1 or x4 PCIe cards and M.2 requires massive lane juggling, and we will show you just how as we look at the Asus B360-F Gaming below. Other than that, total supported USB changes; there's 3.1 G2 in the chipset this time, but you can use fewer RST-enabled devices (with no RAID support) and, most pertinently for the enthusiast, the BIOSes ought to prohibit overclocking on any Intel 8th Gen CPU. This is the real deal-breaker for anyone in possession of a K-series processor, but that's to be expected as Intel reduces the platform cost with these chipsets. 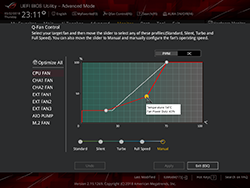 Anyone intent on overclocking - CPU or memory - still needs to look at Z370 first and foremost. The key with any B360 board is to offer a smattering of features without compromising value. 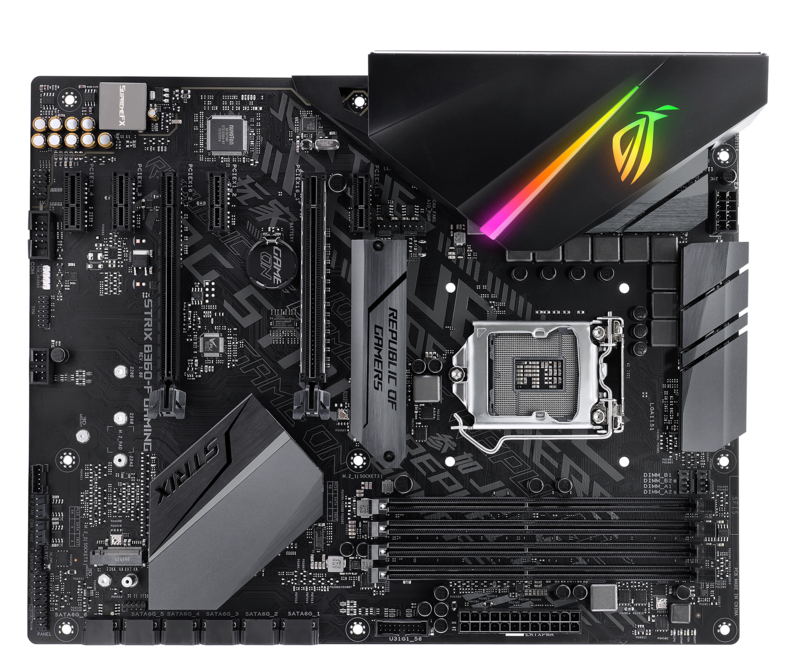 This board can legitimately be thought of as a cut-down version of the Z370 version we reviewed last year. Design is similar, but there are differences that are worth mentioning. Notice the writing across the board? That isn't a watermark; rather it's an attempt to inject some personality and works quite well. The effect is more muted in real life. Heatsink design isn't as grand, either, though basic RGB lighting is still available. Be wary of how sharp the heatsink edges are; yours truly savaged a finger when removing watercooling on the Z370 iteration. 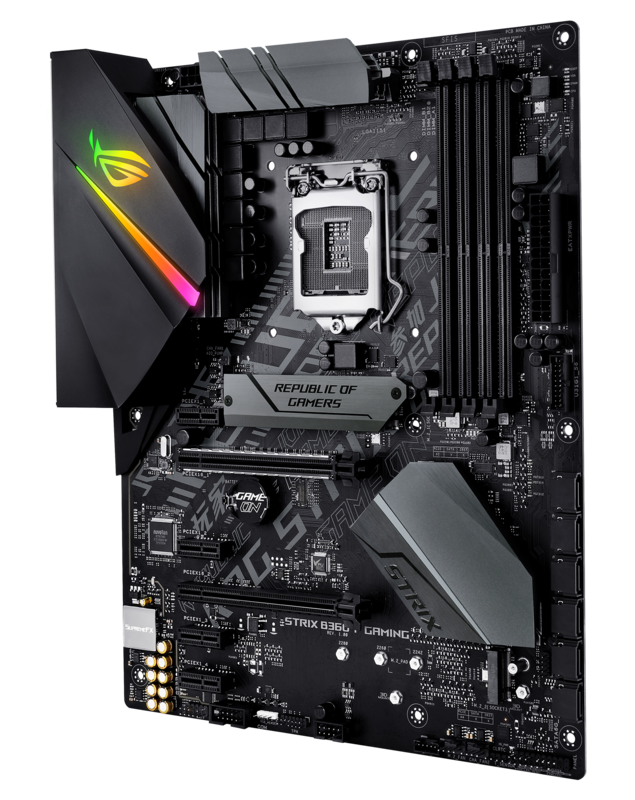 The chipset heatsink is far more basic while Asus chooses the move the M.2 shield to a location between the CPU and primary x16 PCIe slot. It's low profile enough not to block-off the x1 PCIe slot right next to it, and it will likely get some indirect cooling from the CPU heatsink's fan. 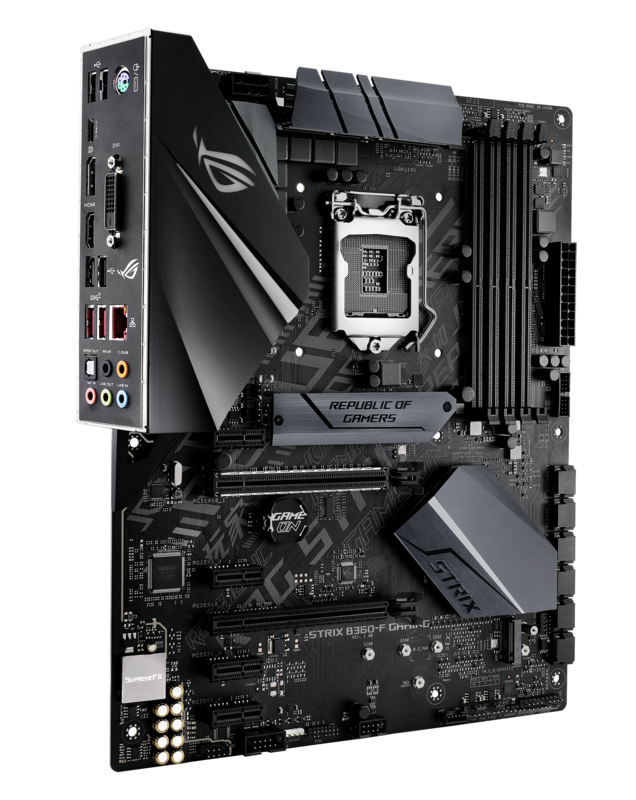 Asus also chooses this location for a couple of four-pin headers. Using a smaller chipset heatsink frees up PCB space on the lower edge, and Asus puts that to good use by locating all the SATA ports side by side, rather than stacking, and it enables a really clean build if using multiple SATA-based SSDs. A second, uncovered M.2 slot, a further trio of x1 PCIe and a mechanical x16 PCIe all bode well for expansion, but this is a case of overkill for the B360 chipset, which has to power them all. Remember the PCIe lane reduction we spoke about at the top of the page, where this chipset has half of Z370? Such a diminution comes home to roost when you consider which slots can be used concurrently. The second, unstrengthened PCIe x16, which can only run at a maximum x4, shares bandwidth with the first two PCIe x1, meaning it drops to x2 if they are populated.. CrossFire is supported for two cards, albeit with heavily stunted bandwidth for the second, though SLI certification is missing, presumably to keep costs in check. The primary M.2 slot, which can run at x4, shares its bandwidth with the fourth PCIe x1 or a SATA port if in that mode. The other M.2 appears to be reserved for Intel Optane memory and has limited bandwidth. In a nutshell, if you are using a single graphics card, a PCIe-riding expansion card and an M.2 drive, you will be fine. Want to go bigger? Z370 is a better bet. 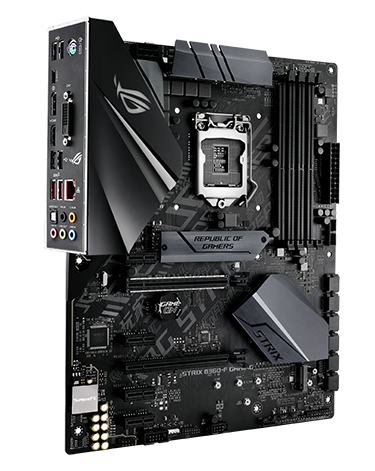 It would be unfair to call this board a vastly poorer cousin of Z370-F Gaming in other respects. 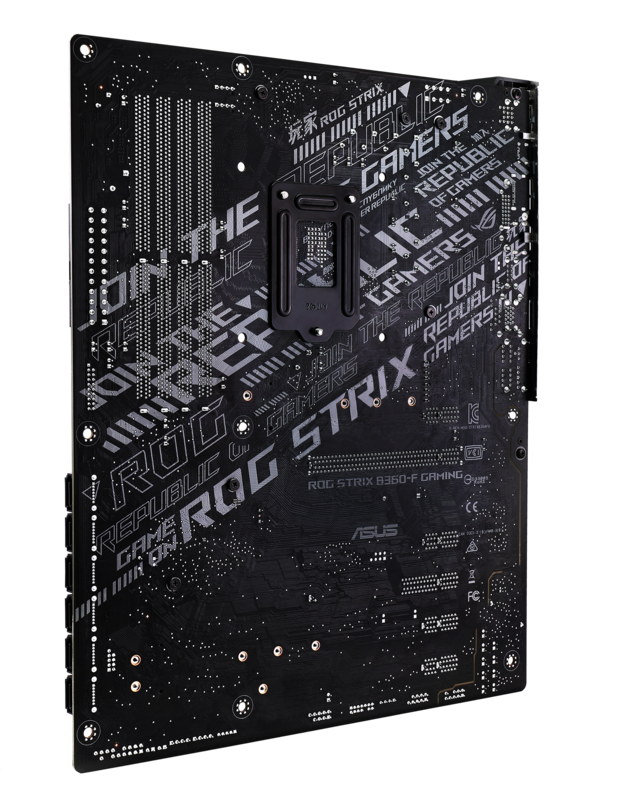 Asus carries over the S1220A audio codec, Intel provides the Gigabit LAN, and making installation into chassis easier and neater, the board has the I/O shield pre-attached. Represented on the back are four USB 2.0, three USB 3.1 Gen 2, including one Type-C, DisplayPort, HDMI and DVI. 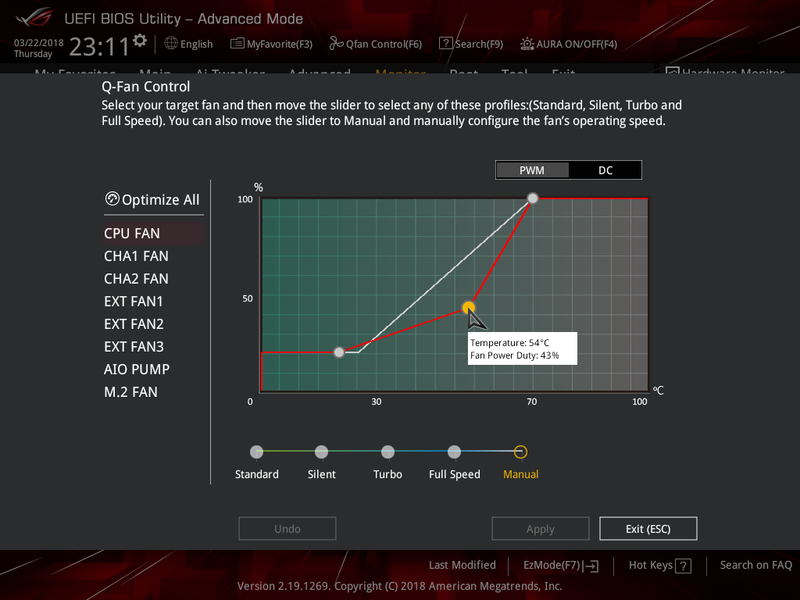 Cooling is well catered for, too, with five four-pin fans for chassis spinners (one is a high-power AIO), and another four-pin connector near the M.2 slot, ostensibly reserved for keeping that drive's thermals in check. If that's not enough, there's a five-pin extension header for hooking up an optional card that provides four more fans. RGB is further in evidence via the usual header, too. Finally, the onboard USB header is first-generation 3.0, sadly, but we shouldn't expect more from this chipset. 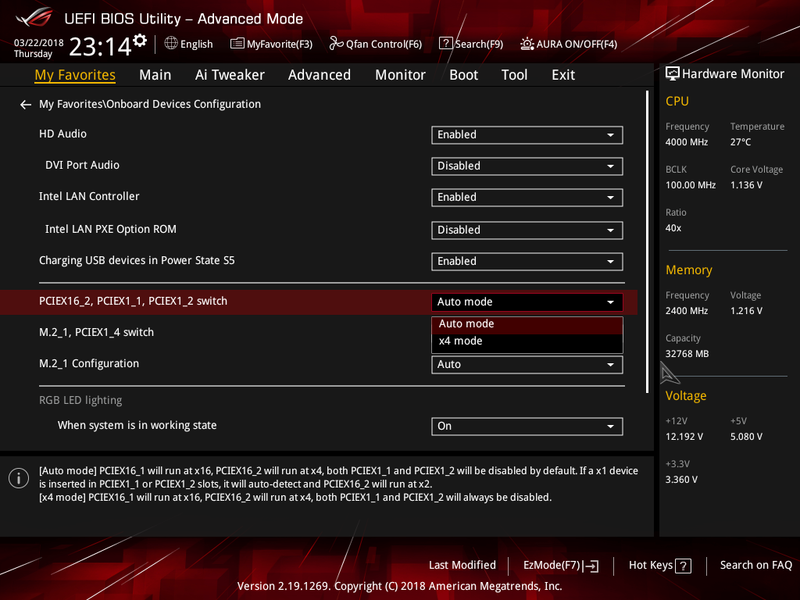 The BIOS is immediately familiar to any user who has dabbled with a recent Asus board. 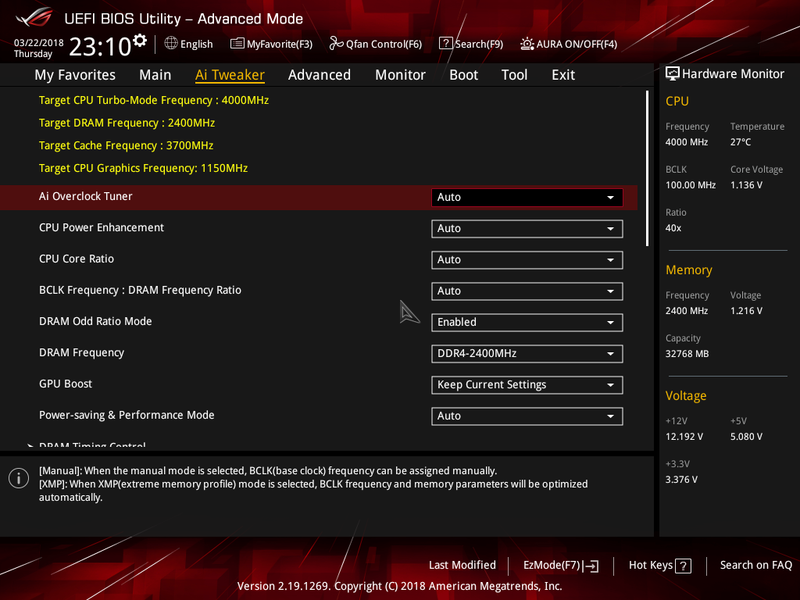 The one key missing ingredient is the lack of overclocking for the CPU, but this is an Intel chipset limitation rather than an Asus disablement. The middle page shows the potential hoops you may need to go through if using lots of high-speed storage, while fan control is the best in the business. 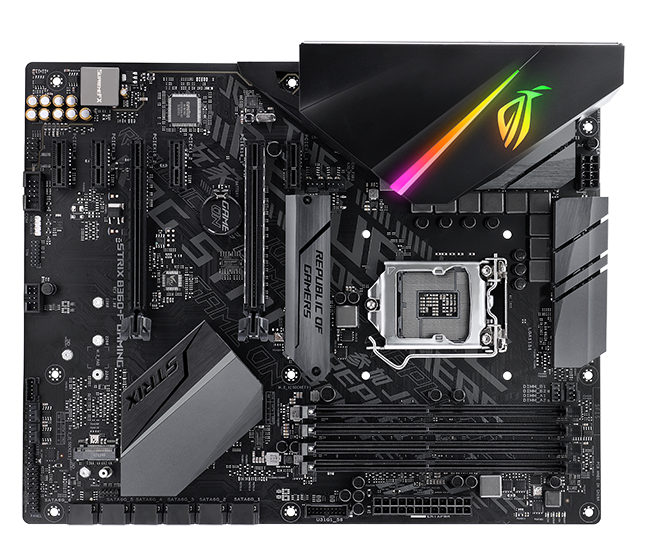 Asus still doesn't offer explicit RGB support in the BIOS, instead relying on a Windows program to change colours and effects. The most you can do is toggle it on or off by pressing F4. 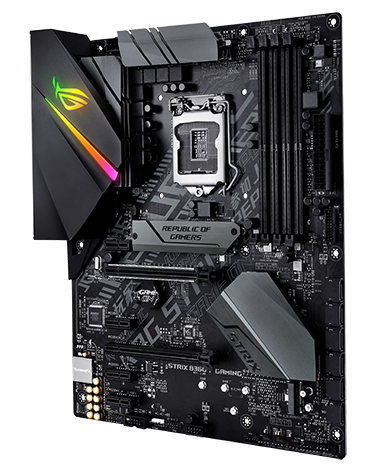 The B360 chipset promises most of the Z370 goodness at a more agreeable price point, particularly if you are going for a simple build. 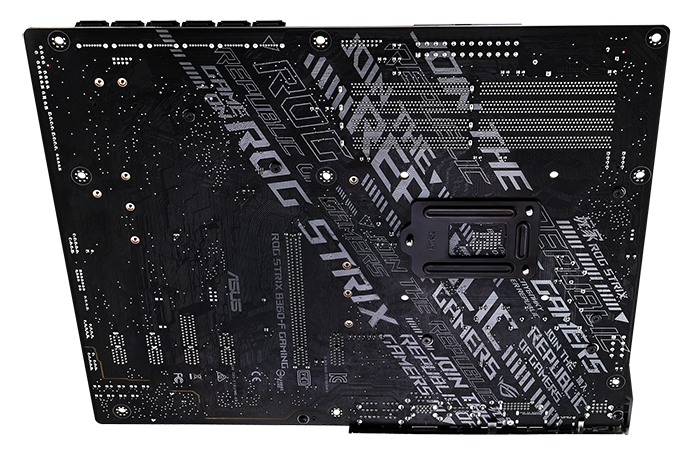 We believe this board retails for £115, or £55 cheaper than the premium chipset.